Home / Adviart Blog / Prepare yourself for everything. Prepare yourself for everything. This adviarter picked the shell because of its design. A hermit used to live in the shell. The outer shell has a crack in it that aligns with the advice. The adviarter decided to use only drawings to explain his point. 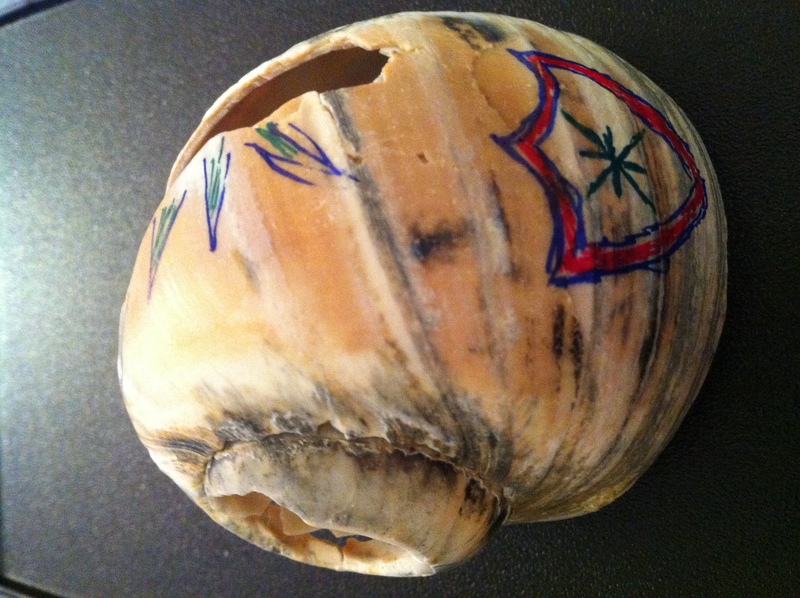 The shell has a shield on it in blue and red that is drawn to symbolize how we have to be prepared to protect ourselves–financially, personally, etc…for anything that can happen. Blue is the adviarter’s favorite color and red contrasts with the blue. However, this contrasts to the other side of the shell with the opening. The adviarter drew a design around this opening to symbolize how we have to prepare for success too–coming out of the shell has its own challenges. We also can’t be afraid to come of the shell when the time is right–to execute on our dreams. The hole allows us to outgrow a shell over time and keep getting better. This design and advice spoke to me clearly. I think the preparation for as many different things that can happen in life is a fantastic piece of advice. I like being prepared. I value the fine balance between balance the status quo and needing protection and the future opportunity to outgrow a shell. I often fear outgrowing things but once I accept the growth that has occurred–it is easier to move forward and explore new options. The new shell often requires a different or enhanced shield and still allows for growth outside–until you move to a next shell. The circle of life. How can we ensure that are are protecting and growing at the same time? Do you have characteristics that you can identify that are indicative of the season of change and growth that are coming on? How can you recognize these things in your life and embrace them each day?